We’re pleased to announce a new series to our blog: Scanning Nuremberg. Scanning Nuremberg will share the observations and insights of Matt Seccombe, Nuremberg Trials Project Metadata Manager/Document Analyst, as he analyzes documents for digitization as part of the HLS Library’s Nuremberg Trials Project website. Matt shares not only the statistical progress of the project and behind-the-scenes of digitization, but insights into patterns of the cases, topics of testimony, ghosts of missing text, and mysterious phrases. We hope you’ll find his monthly observations as fascinating as we do. Look for the first official post early next week; we’ll update every two weeks until we get caught up with Matt! 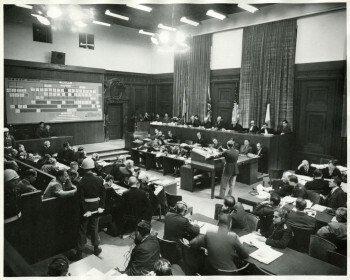 The Harvard Law School Library holds approximately one million pages of documents relating to the trial of military and political leaders of Nazi Germany before the International Military Tribunal (IMT) and to the twelve trials of other accused war criminals before the United States Nuremberg Military Tribunals (NMT). We have already digitized NMT 1 (U.S.A. v. Karl Brandt et al. ), NMT 2 (U.S.A. v. Erhard Milch), and NMT 4 (U.S.A. v. Pohl et al. ), and we’re in the process of digitizing our remaining holdings. We expect to have NMT 3 (The Judges’ Trial) completed and available to the public by the summer of 2015.